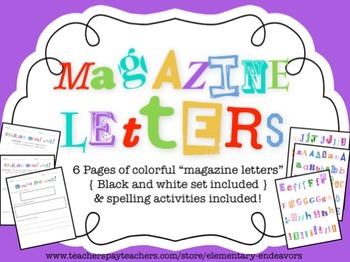 With this PDF file you'll get 6 pages of colorful "magazine letters" (uppercase and lowercase letters in different fonts). A black and white version is included as well as a single sheet of letters A-Z for student hand outs / copies. Word work activity pages are also included! Leave a comment and let me know how you plan to use these magazine letters in your classroom. Enjoy!